Sumba Island belongs to the poorest and most remote regions in Indonesia and few years ago many of its 685,186 (2010) inhabitants did not have access to electricity at all. Until 2010, the island entirely relied on generators running on diesel fuel, when a study revealed the promising, but unexploited potential of hydropower, wind energy, solar power and biogas on the island. The Dutch global energy consultancy company KEMA even assessed the potential of wind and hydropower as sufficient to power the entire island with renewable energy at even lower costs. 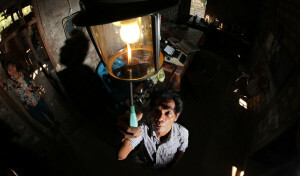 In collaboration with Hivos, a Dutch development organisation, the Indonesian Ministry of Energy and Mineral Resources decided to utilise this renewable energy potential and in 2013 the Ministry officially declared its responsibility to implement the 100% renewable energy target on Sumba Island. The project known as the Iconic Sumba project is a conglomerate of international donors and the local government with the aim to electrify 95% of the island and exclusively provide power from renewable energy until 2025. Hivos has worked with the private sector and other civil society organisations to jointly implement these targets. Moreover, the Indonesian Ministry of Energy has taken responsibility for the implementation of Sumba Island’s energy transition, and efforts are now underway to increase both domestic as well as foreign investment. The Asian Development Bank as well as the Dutch and Norwegian governments contributed financially to support the initiative. By achieving the set targets, Hivos seeks to “show that access to renewable energy can alleviate poverty even in remote and isolated areas”. Until 2015, the electrification ratio was doubled reaching almost 40%. This does improve the livelihoods of the islanders, since they do not rely on unhealthy kerosene and wood for lighting and cooking. In combination with a reduced use of the island’s diesel generators Sumba Island also reduces its greenhouse gas emissions. At the same time, the profits from the electricity are reinvested into the community. Today, Sumba Island is still pursuing its transformative pathway towards electrification of the island and a 100% renewable energy generation. Most of the projects being developed are relying on solar PV, biogas, or micro-hydro systems. However, challenges remain on the way towards the 100% target. While the electricity generation from hydropower works reliable, wind energy is affected by broken system components and it lacks in specialists for maintenance. Local voices already call for governmental action in order to maintain the island on track to meet its targets in 2025.